Being a nerd and a geek, I have a lot of different interests. I have created over sixty applications for iPad and I have been involved in creating content for a lot of different publications. Over the last two years one of my favorite leisure readings is in the field of intellectual property ( also known as IP). I have made some mistakes by not protecting all my intellectual property accordingly over the past several years. I have learned to protect my hard work! Protection costs money so… be prepared. 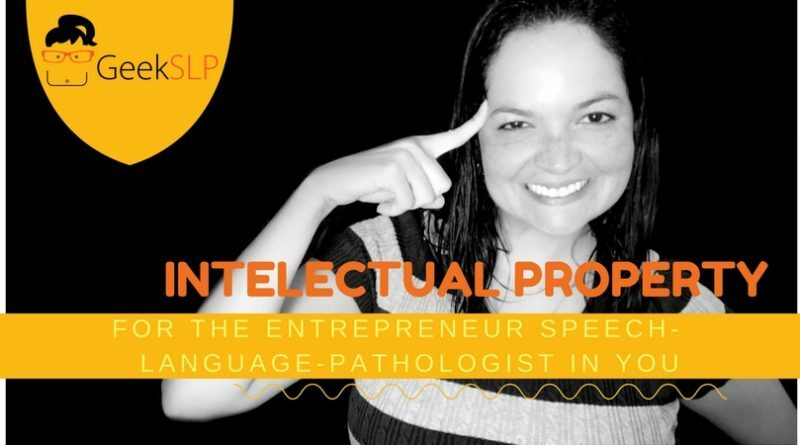 I have had the pleasure of being involved in various online debates on the subject, and I know that among the various content creators speech-language-pathologists there is a lot of confusion on the subject. Today, I am here to shed some interesting light on the subject that interests me so much to the point of owning several books and reading a lot of law cases. Over the past few years, a few cases that related to intellectual property have come up within our field; one a case of trademark and another involving alleged patent infringement. I have had the pleasure and/or displeasure to read all of the court documents that I was able to find online on both of the cases. On both cases, I don’t think the SLPs involved could have predicted that things would get ugly or avoided them based on the law. If you are also an SLP and interested on the subject, please get in touch! Let’s have an IP book club. I LOL a lot on my own. My full disclaimer: I am nothing more than someone interested immensely on the subject. I am not an attorney; all my education is self-exploratory. If you have any specific question, please consult an intellectual property attorney. The advice and information here is not intended to replace what you would hear from an attorney. I truly believe in the value of self-education and building our knowledge and analytical skills on any subject matter. 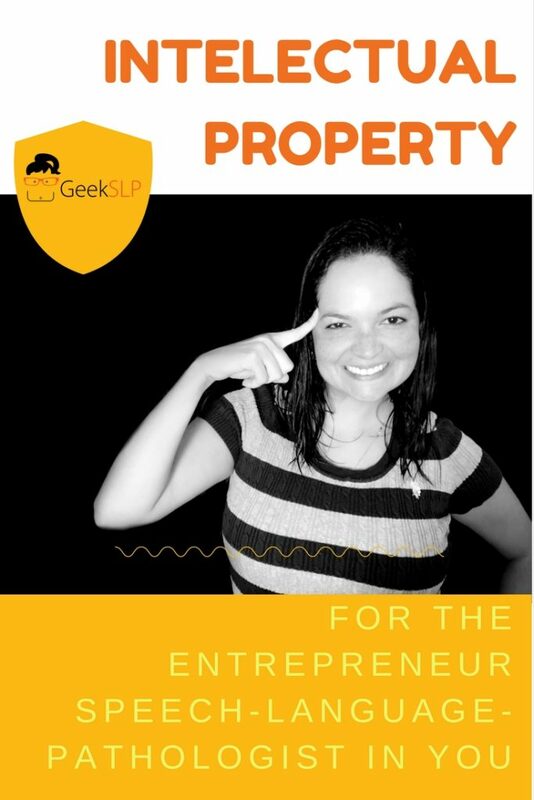 As an entrepreneur, you must find the time to learn about a lot of different subjects, such as accounting, law, marketing and many other subjects that would make yourself even more successful. Lack of knowledge is an entrepreneur’s worst enemy. It is hard not to get confused by these terms, and spit out these words without any knowledge of what they really mean. So, we will start there. I will try to bring these terms to a more SLP friendly reality, showing examples within our SLP world. However, understanding these terms would take a lot more than reading a couple paragraphs of each. There is a lot more to each one of these terms that I could possibly try to explain in simple sentences. At the end of this post you will find suggestions of possible reading materials. Let’s start of with my favorite word: Idea. First we can talk about the code. The code of your articulation application can be protected by a copyright application. You can do the same with the art and user interface of your articulation app can also be protected under works of visual arts. If there is a novelty to your specific articulation application that has never been done before, you can even attempt to file a patent application for it. Finally you can also file a trademark for the name of your application. However there are things you cannot protect: your word list or your short phrases. Word lists and short phrases are not protected by copyright at all. Well, that makes sense. Can you imagine that just because an app uses the word “ I love you” for targeting the initial “L” in the word “ love”, how nuts would it be if no other SLP could use that phrase? Bottom line: Ideas are not protectable, however there are a lot of things within your finished product that can be protected. Since we talked about our fictitious articulation application, let’s say I create an app called “ Minimal Pairs Academy”, I can apply for trademark to make sure no other app for articulation will use that name. I could even argue that if someone tried to create a product called “ Maximal Pairs Academy” that it is too close to my brand name. A trademark is the face of your product, or your company. I made sure to register trademark for my company and products. If you are a TPT seller, it probably would make sense to apply for trademark of your company name, however unless your product is earning you enough money registering for trademark for your TPT products would not be cost efficient. Here are some examples of SLP brands that are a registered trademark that you might know of: Smarty Ears, Super Supper, Linguisystems. If you have a brand name for your blog, or your products you may consider getting it trademarked. One of the first steps is by doing a search on the United States Patent and Trademark Office. Actually, before you start using any product name, I would recommend doing a search to make sure the mark is not registered by someone else. Bottom line: A trademark relates to the brand that you want to put forward. Copyright relates to the exclusive right to copy and distribute their content, such as literary works, music or their illustrations. These rights however, are limited and were created to promote both the advancement of the arts and also to protect creators. This is the most fascinating part of intellectual property for me: Of course you want to get credit for the work you put into a book. However, there are limits to this exclusivity. Can you imagine if the first SLP that created a word list of articulation targets could copyright her word list and prevent you from using that list? That would make all fields very limiting, wouldn’t it? Another thing within copyright is that you and another SLP can accidentally create the same word list for your articulation app and if one sues the other and they have never heard or seen each other’s work there is no infringement. In order to commit a copyright infringement you must have seen the other person’s work. There is no such a thing as an “ accidental” infringement within copyright, however the same is not the case for patent. You may never have seen a product and if you accidentally create a product that infringes on someone’s patent you may be obligated to stop selling your product. One thing that is important within copyright is that you can create your word list for your articulation therapy app, while another SLP creates theirs and obviously since both of you are trying to find appropriate words for each age level you will come up with a very similar list. However both of you have freedom to use your own lists even if they are identical. Have you heard the expression great minds think alike. Now imagine if these great minds are within the same field, and received the same training. How hard would it be to have lists that are similar, I mean if you are doing an articulation application words that start with “b” can only go certain places, right? If I create a variety of questions and answers for an app, I can submit the content of these apps (questions and words) to the copyright office for a fee for protection under the works of literary arts. We have our great shirt designer Peachie Speechie, they create amazing shirts for speech therapists and their shirt design could be sent for copyright protection. Another example is within videos. Some of us make videos for speech therapists. We can send those videos for copyright protection. If you create a manual for using apps, an online book, or any other material such as games for your TPT store, I would recommend sending for copyright protection too. Why do you want to send your materials for copyright protection? While we all get protection from the day we create our content, one very important reason to send your material to copyright protection would be your power to take action if someone copies your work. One of the biggest expenses in copyright is hiring the attorney to sue or make the person who copied you take the product down. If you did not register your material within the copyright office BEFORE you were copied, you cannot recover the attorney fees or other fees you would get if infringement is found. So ultimately it may cost you more to sue the copier that you would ever recover because sales of your copier would be so low. This would especially apply within our field where we are not becoming millionaires from our products. The fees for filling for copyright are very low ( around $35), so I would recommend that you file your material with the copyright office. A patent relates to a novelty way to do something. Patents generally relate to the system behind a product. It is within the realm of patent that I made one of my biggest mistakes of my professional life: Not patenting my favorite application, the Sunny Articulation & Phonology Test Kit. Since we have talked about Trademark, I can still attempt to trademark the short phrase“ Sunny Articulation and Phonology Test Kit”, however the value of this app is not on the app name but on what it does, the system of analyzing phonological errors . I created this application back in 2010, and it was truly a revolutionary and unique system for analyzing articulation and phonology skills. If I gave over 50 presentations, on nearly all of them people would clap when they saw what this app could do. However, there is a time limit to file for a patent, which I would have needed to do before I made this application public. Of course, even though I loved the application, I had no idea that it would be a hit. I had no idea that by not protecting it someone could eventually learn the method and create a better way using the basic functions of the program, which is what eventually happened a couple years ago. I learned the hard way, that if you do not protect your mousetrap, someone will come and make one the same, similar, better or worse than yours. I can guarantee you will not be happy. One fun thing about patent is that it does not matter if the person actually copied you or not! Even if they DID not know about your product, and created something that uses your process you can take some action. Patent is unique in that one it is yours, everyone else has to license it from you. Differently from copyright and trademark, which are more flexible. Patenting something is very expensive and you most likely will need the help of an attorney to file your registration. You cannot patent “ names” or “slogans” or “ looks” – patents are related to systems and functions. I am not sure, but an example within our field would be “ Speech Buddies” and their design of their product, which to me could have received a design patent. I see people on the teachers pay teachers store accusing a lot of the other SLPs of copying word lists, or ideas, themes. I hope that now you will know both the extent of the work you should do to protect your hard work, as well as what is and what is not appropriate to say when finding works online that may resemble yours. 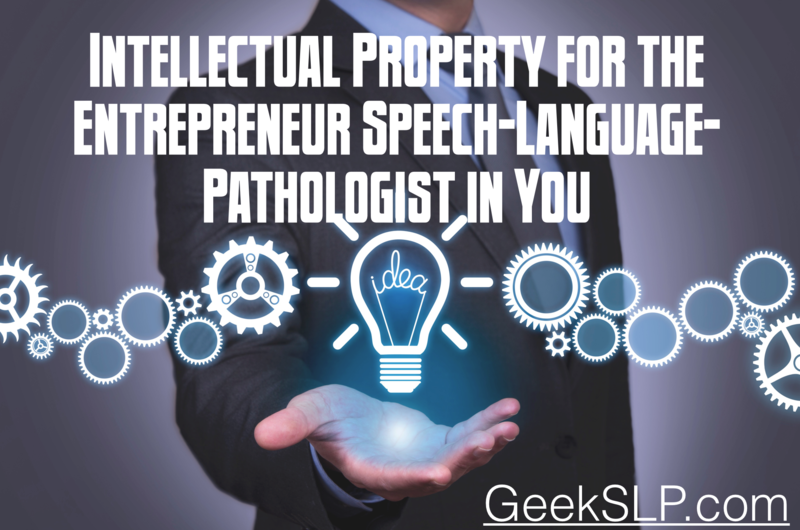 I hope this post was helpful to entrepreneur SLPs that must understand how to protect their intellectual property. Quest on! Here are some of my favorite books; all of them have an eBook version either on Kindle or iBooks.